North Carolina Society of Accountants, Inc. Promoting professionalism in accounting and taxation since 1947. 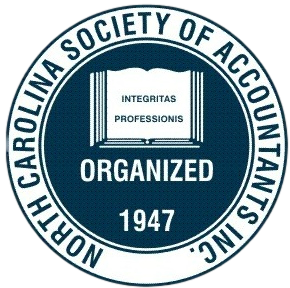 The North Carolina Society of Accountants is an organization comprised of accountants, enrolled agents, CPA’s, bookkeepers and tax preparers. We have serviced our industry since 1947. Our members enjoy benefits such as continuing professional education, state legislative monitoring and an annual state convention. Membership also provides an extensive network of accounting professionals, which serves as an invaluable resource for information, assistance and referral. On a monthly basis, local chapters offer the opportunity to network and to receive continuing professional education. Chapters are located in the following areas: Asheville, Burlington, Charlotte, Fayetteville, Greensboro, Greenville, Hickory, High Point - Winston-Salem, Raleigh, Sandhills-Sanford, and Wilmington. A gateway to national accreditation through the Accreditation Council for Accountancy and Taxation, Inc.
Quality Assurance Review shall be mandatory for all members that submit and issue Compilation financial statements to third parties (Banks, Investors, Insurance companies).